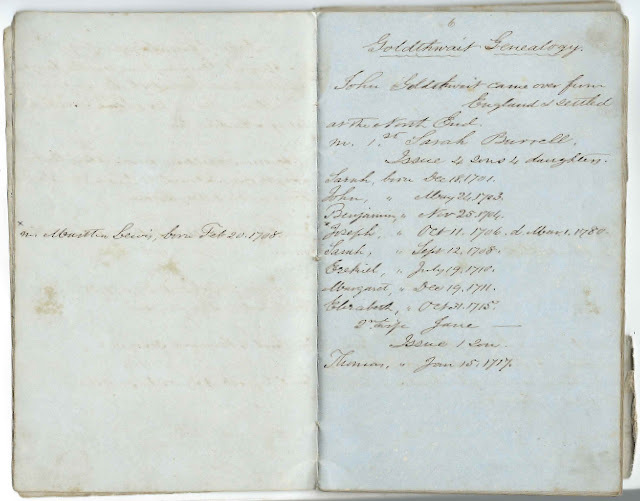 c1851 handwritten genealogy of the Dorr & Goldthwait, and related families, of Massachusetts, handwritten by Rev. Theodore Haskell Dorr for his older brother Addison Dorr, who had married at Buenos Aires in 1831 and was raising a family there. 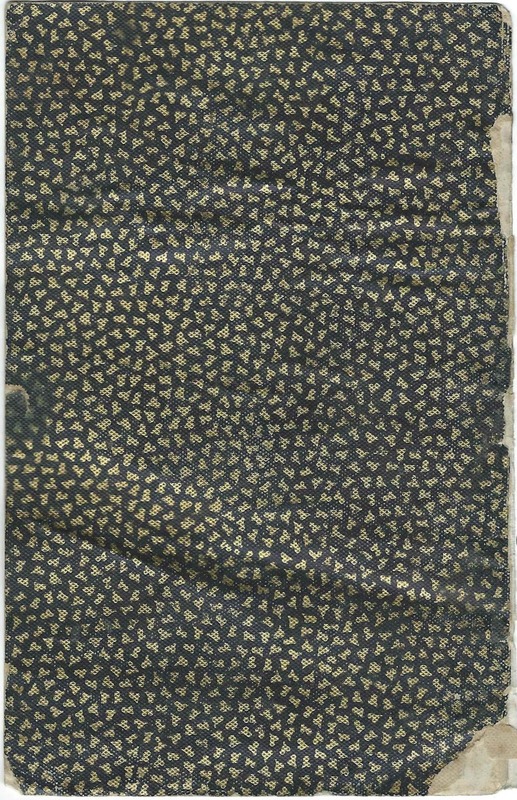 The booklet, which is approximately 6-1/2" by 4", is accompanied by a journal/album of photographs, locks of hair, umbilical cords, clippings, letters, documents, etc. of the Addison Dorr family of Buenos Aires. The genealogy includes the names and birth dates of about 275 people. An alphabetical surname list and an alphabetical list of the people mentioned, including any details offered, appear at the end of this post. Note: Developing the list of people mentioned was complicated and might contain errors, not only by the transcriber but perhaps also by the author, Rev. Theodore Haskell Dorr. If something looks amiss to you, please leave a comment or contact me directly by email (under Inquiries) - thanks! It's not an exhaustive list of people with Dorr and Goldthwait ancestry, but rather contains the branches that led to Rev. Dorr and his brother Addison, whose parents were John Dorr, born October 2, 1770, and Esther (Goldthwait) Dorr, born October 9, 1775. 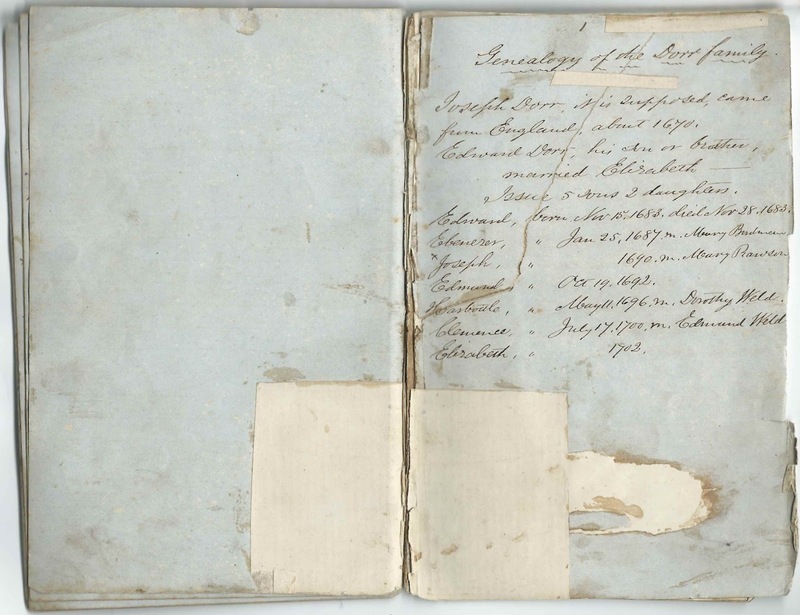 Dates for deaths known to the author are also included, as are marriage dates and the names of spouses. The latest year of birth noted is 1850, and two deaths are noted in the year 1851. Some families would go on to have more children; even the author himself had another child born after this genealogy was completed. 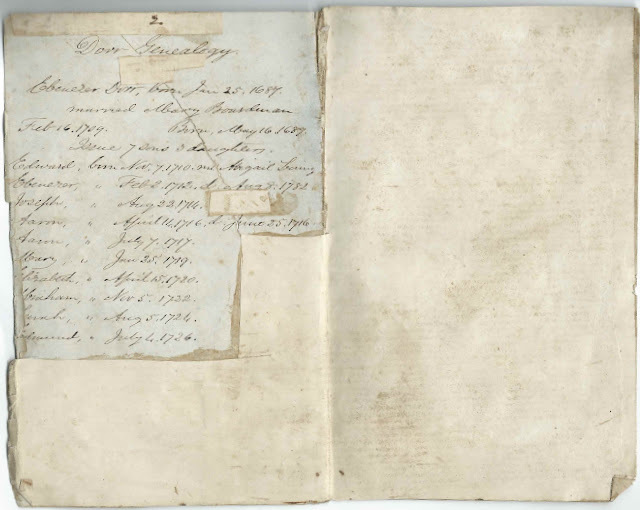 One of the last pages details Joseph Dorr, who came to Massachusetts from England about 1670, and Joseph's son Edward, who married Elizabeth and had five sons and two daughters with her, one of whom was Ebenezer Dorr, born in 1687; more on him farther below. 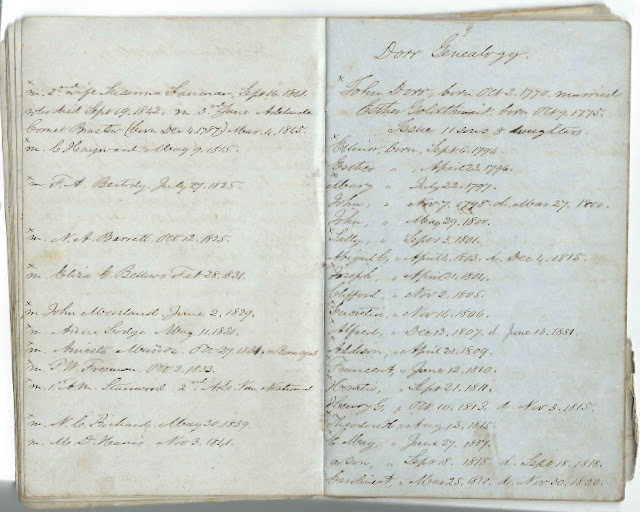 The last page details the children of Ebenezer Dorr, born in 1687, and wife Mary Boardman, born in 1689. They married in 1709 and had seven sons and 3 daughters. Ebenezer and Mary were the second great grandparents of Theodore Haskell Dorr and his older brother Addison Dorr. Below, facing pages detailing the children of John Goldthwait who came from England and settled in the North End of Boston. He married, first, Sarah Burrell; they had 4 sons and 4 daughters. John later married Jane (? ); they had a son Thomas Goldthwait, born in 1717. Among the children of John Goldthwait and first wife Sarah (Burrell) Goldthwait was Joseph Goldthwait, born in 1706, who married Martha Lewis. Joseph and Martha were the great grandparents of Rev. Theodore Haskell Dorr and older brother Addison Dorr. The first page in the album deals with Rev. Ebenezer Dorr, born in 1712, who settled at Mendon, Massachusetts. Ebenezer and wife Amy (Plympton) Dorr were the great grandparents of Addison Dorr and Theodore Haskell Dorr. 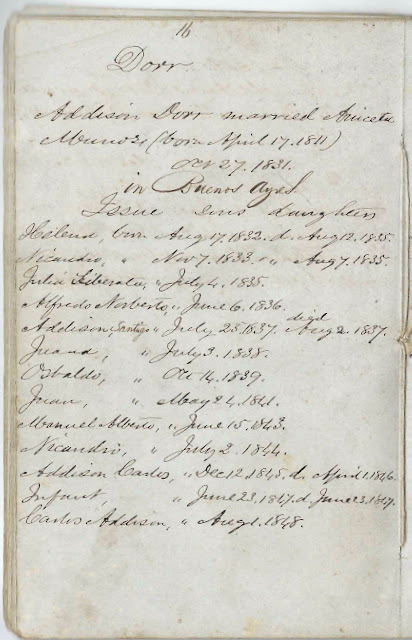 Below, the page listing the children of Addison Dorr and Ancieta (Munoz) Dorr, who married in 1831 at Buenos Aires. There may have been additional children born after this booklet was completed. The page listing the children of Rev. Theodore Haskell Dorr and wife Nancy Caroline (Richards) Dorr, who married in 1839. 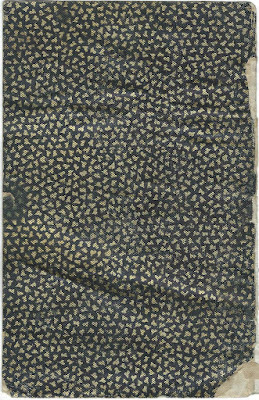 One more son would be born, after this booklet was completed. 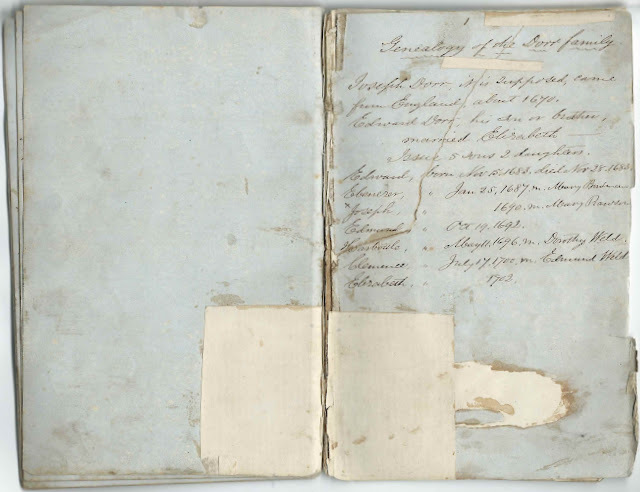 People mentioned in the Genealogy - As noted above, developing this list was complicated and might contain errors, not only by the transcriber but perhaps also by the author, Rev. Theodore Haskell Dorr. If something looks amiss to you, please leave a comment or contact me by email (under Inquiries) so I can check where the error originates - thanks! Martha Maria Adams; married Lemuel Hayward. Ann Bradish Billings; married Andrew Cunningham Dorr (born 1804) on April 28, 1836 - they had at least four children. Mary Boardman, born May 16, 1689; married Ebenezer Dorr (born 1687) on February 16, 1709. They had 7 sons and 3 daughters. Sarah Caroline Brinkerhoff; married Francis O. Dorr on August 4, 1840; Issue: at least 2 children. Daniel Chaplin; married Caroline Augusta Hayward in 1845; they had at least two sons and a daughter. Addison Child; married Abba Cunningham Child (born 1817]. David Weld Child, born February 19, 1772; died February 2, 1830; married Abigail Dorr (born 1766) on April 19, 1801; they had three sons and a daughter. Amos Cotting; married Helen Augusta Dorr on November 12, 1846; they had at least two children. Abigail Cunningham, born July 11, 1739, daughter of William and Elizabeth Cunningham [another source, which I haven't verified, gives Elizabeth's maiden name as Wheeler]. She was the first wife of Ebenezer Dorr (1738-1809) whom she married on January 7, 1763 and with whom she had 8 sons and 4 daughters. Andrew Cunningham, possibly born January 12, 1759, and possibly the son of James Cunningham (born 1721) and Abigail (?) Cunningham - Rev. Theodore Haskell Dorr wrote this information in the family history but later put three diagonal lines through it. James and wife Mary (?) Cunningham had 9 children. James Cunningham, born April 24, 1721; brother of Abigail (Cunningham) Dorr (born 1739). James married Abigail. According to the family history written by Rev. Theodore Haskell Dorr, James and Abigail had children Susannah, born August 15, 1757, and Andrew, born January 12, 1759, but these two entries have diagonal marks on them, so they may have been the children of someone else. Susannah Cunningham, born August 5, 1757, daughter of James (born 1721) and Abigail Cunningham. This entry has 3 diagonal lines running through it, so may be in error. William Cunningham, born November 19, 1694, third son of Andrew and Sarah Cunningham; married Elizabeth [a source I haven't verified myself gives Elizabeth's maiden name as Wheeler] William's daughter Abigail Cunningham (born July 11, 1739) married Ebenezer Dorr on January 7, 1763. Abigail C. Dorr, born April 4, 1803; died December 4, 1815. Son of John Dorr (born 1770) and Esther (Goldthwait) Dorr (born 1775). Addison Dorr, born April 21, 1809. Son of John Dorr (born 1770) and Esther (Goldthwait) Dorr (born 1775). 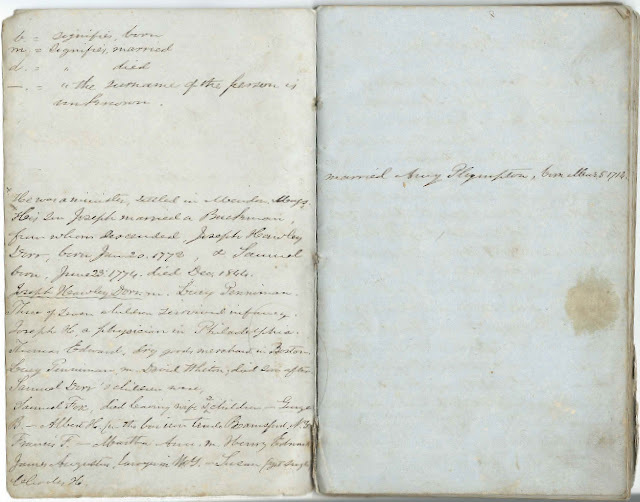 [adjacent entry on left facing page: married Aniceta Munoz October 27, 1831 at Buenos Ayres]. Addison Dorr and Ancieta (Munoz) Dorr had at least 13 children. Alfred Dorr, born December 12, 1807; died June 13, 1851. Son of John Dorr (born 1770) and Esther (Goldthwait) Dorr (born 1775). [adjacent entry on left facing page: married Anne Lodge May 11, 1830]. Alfred had at least 6 children with Anne. Annie Carrington Dorr, born March 16, 1837; died March 5, 1839. Daughter of Andrew Cunningham Dorr (born 1804) and Ann Bradish Billings Dorr. Caroline A. Dorr, born March 25, 1820; died November 30, 1820. Daughter of John Dorr (born 1770) and Esther (Goldthwait) Dorr (born 1775). Clifford Dorr, born November 2, 1805. Son of John Dorr (born 1770) and Esther (Goldthwait) Dorr (born 1775). E. May Dorr, born June 27, 1817 [adjacent entry on left facing page: married M. D. Harris November 3, 1841]. Ebenezer May Dorr, or Eben May Dorr, and Martha Dennis [Harris] Dorr would have at least 4 children. Ebenezer Dorr, born February 2, 1712; died August 8, 1782. He was a minister who settled at Mendon, Massachusetts. Son of Ebenezer Dorr (born 1687) and Mary (Boardman) Dorr (born 1689); married Amy Plympton. They had 8 sons and 5 daughters. Ebenezer Dorr, born January 25, 1687; married Mary Boardman. Son of Edward and Elizabeth Dorr. Elizabeth's maiden name, from another source, was Hawley. Ebenezer Dorr and Mary (Boardman) Dorr had 7 sons and 3 daughters. Elizabeth Dorr, born January 9, 1769; died April 24, 1843. Daughter of Ebenezer Dorr (1738-1809) and first wife Abigail (Cunningham) Dorr. Esther Dorr, born April 23, 1796. Daughter of John Dorr (born 1770) and Esther (Goldthwait) Dorr (born 1775). Frances Anne Dorr, born June 12, 1810. Daughter of John Dorr (born 1770) and Esther (Goldthwait) Dorr (born 1775). [adjacent entry on left facing page: married. P. W. Freeman October 2, 1833] Peter Wilder Freeman, born December 31, 1809. Francis Anne (Dorr) Freeman and Peter Wilder Freeman had at least 8 children. Henry G. Dorr, born October 10, 1813; died November 3, 1815. Son of John Dorr (born 1770) and Esther (Goldthwait) Dorr (born 1775). John Dorr, born May 29, 1800. Son of John Dorr (born 1770) and Esther (Goldthwait) Dorr (born 1775). John Dorr, born November 7, 1798; died March 27, 1800. Son of John Dorr (born 1770) and Esther (Goldthwait) Dorr (born 1775). John Dorr, born October 2, 1770. Son of Ebenezer Dorr (1738-1809) and first wife Abigail (Cunningham) Dorr. 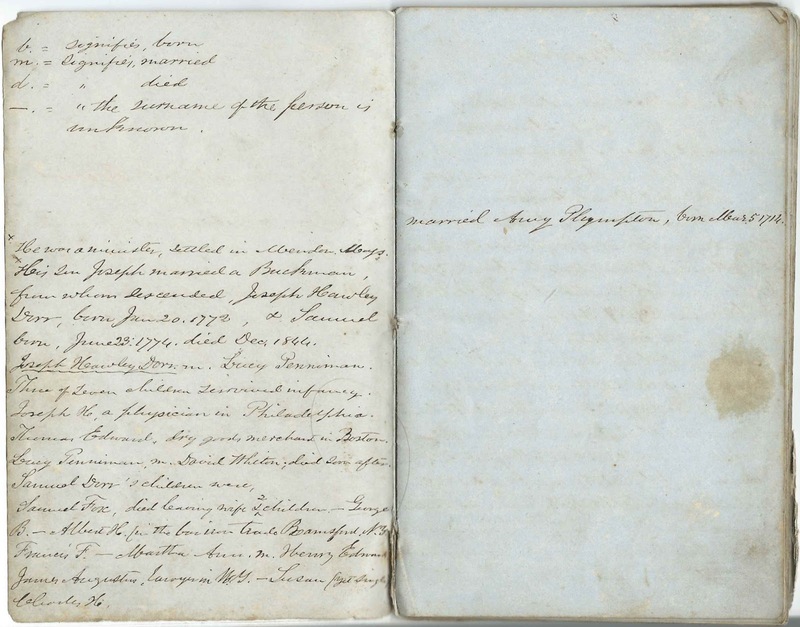 [adjacent entry on page 5: married Esther Goldthwait December 11, 1793. John Dorr married as 2nd wife Susanna Lanman on September 16, 1842; she died September 19, 1842. 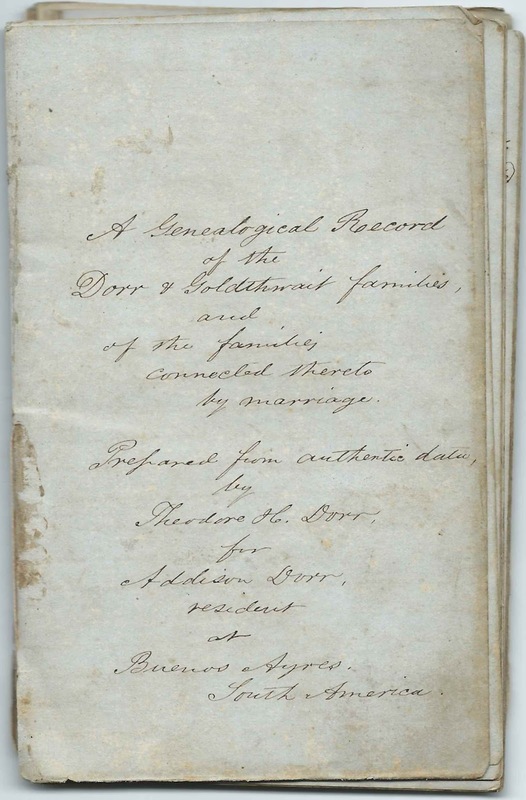 John Dorr married as his third wife Adelaide (Cornet) Brastow (born December 4, 1787) on March 4, 1845.] John Dorr and Esther (Goldthwait) Dorr had 11 sons and 8 daughters. Joseph Dorr, born 1690; son of Edward Dorr and Elizabeth Dorr. Joseph married Mary Rawson. Joseph Dorr, born December 3, 1767; died October 21, 1831. Son of Ebenezer Dorr (1738-1809) and first wife Abigail (Cunningham) Dorr. Joseph Dorr, it is supposed, came from England about 1670. Joseph Goldthwait Dorr, born April 21, 1804]. Son of John Dorr (born 1770) and Esther (Goldthwait) Dorr (born 1775). 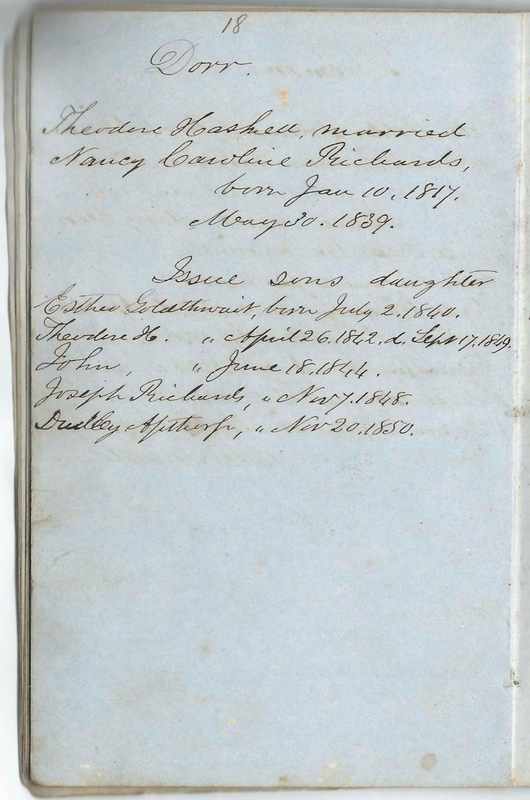 [adjacent entry on left facing page: married Eliza E. Bellows February 28, 1831] Joseph Goldthwait Dorr and Eliza Eames (Bellows) Dorr had at least 5 children. Lucretia Dorr, born June 19, 1781. Daughter of Ebenezer Dorr (1738-1809) and first wife Abigail (Cunningham) Dorr. Moses Dorr, born May 26, 1737; died September 6, 1811. Son of Ebenezer Dorr (1712-1782) and Amy (Plympton) Dorr (born March 5, 1714). Sally Dorr, born February 26, 1774; died May 12, 1798. Daughter of Ebenezer Dorr (1738-1809) and first wife Abigail (Cunningham) Dorr. Son Dorr, born September 18, 1818; died September 18, 1818. Son of John Dorr (born 1770) and Esther (Goldthwait) Dorr (born 1775). Sullivan Dorr, born October 12, 1778. Son of Ebenezer Dorr (1738-1809) and first wife Abigail (Cunningham) Dorr. William Dorr, born June 4, 1764; died December 19, 1845. Son of Ebenezer Dorr (1738-1809) and first wife Abigail (Cunningham) Dorr. Widow Eliza Flinn (August 1752-June 10, 1839 - not sure of day), second wife of Ebenezer Dorr (1738-1809); they married January 12, 1800. No children listed for Ebenezer Dorr and the widow Eliza Flinn. Peter Wilder Freeman, born December 31, 1809; married Frances A. Dorr (born 1810) on October 2, 1833. They had at least 8 children. Benjamin Goldthwait, born August 6, 1737, son of Joseph Goldthwait (1706-1780) and Martha (Lewis) Goldthwait (1708-1783) [adjacent entry on left facing page: married Sarah White Dawes in 1759] They had 3 sons and 8 daughters. Esther Goldthwait, born October 9, 1775; died July 28, 1840 Daughter of Benjamin Goldthwait (born 1737) and Sarah White Dawes Goldthwait (born 1736) [adjacent entry on facing page: married John Dorr on December 11, 1793]. Esther (Goldthwait) Dorr and John Dorr had 11 sons and 8 daughters. Joseph Goldthwait, born October 11, 1706; died March 1, 1780; son of John Goldthwait and first wife Sarah (Burrell) Goldthwait. [Adjacent entry on the left facing page: married Martha Lewis, born February 20, 1708] on February 9, 1728. They had 7 sons and 3 daughters. Martha Dennis Harris; married Ebenezer May Dorr (born 1817) on November 3, 1841. Martha, who died November 20, 1848, and Ebenezer would have at least 4 children. Caroline Augusta Hayward, presumably the daughter of Charles Hayward and Ellinor (Dorr) Hayward; married Daniel Chaplin in 1845; they had at least two sons and a daughter. Ellinor Dorr Hayward, presumably the daughter of Charles Hayward and Ellinor (Dorr) Hayward. 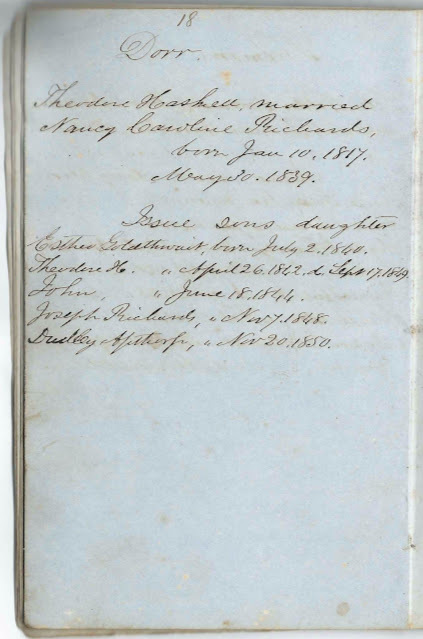 Ellinor Dorr Hayward married James Robbins Walker on April 15, 1840; they had two sons. James Lanman, first husband of Susanna Goldthwait (born 1765). James died June 2, 1809. Martha Lewis, born February 20, 1708; died October 26, 1783. Married Joseph Goldthwait (1706-1780) on February 9, 1728 and had 7 sons and 3 daughters with him. Ancieta Munoz; married Addison Dorr (born 1809) on October 27, 1831 at Buenos Aires. She and Addison had at least 13 children. Charlotte Plympton; married Andrew Cunningham Dorr (born 1772) in 1803; they had 4 sons and 6 daughters. Nancy Caroline Richards; married Theodore Haskell Dorr (born 1815) on May 30, 1839. Rev. Theodore Haskell Dorr and Nancy Caroline (Richards) Dorr had 5 children by the time he wrote this genealogy, but another son would be born in 1856. A. L. Van Nostrand; second wife of Horatio Dorr (born 1811). Horatio Dorr and Adaline L. (Van Nostrand) had at least two sons and two daughters. Again, if you have noted errors, please leave a comment or contact me directly. Thanks for stopping by!